Kerala's architecture is an ensemble of simplicity and elegance. Simple and all embracing, it is tailored to suite Kerala's climate and culture. The time-tested dexterity of Kerala's master architectures is ostensible in the construction of umpteen temples, mosques and churches bestrewn across the state. The temples structures have intricate details that are breathtaking, which never fails to fascinate an observer. Agraharams, the conglomeration of Tamil Brahmin houses, at Kalpathy in Palakkad show the fulgent face of aesthetic sense of a generation. Bypore Khalasees, a microscopic group in Kozhikode, have devised their own method of construction. This endangered Muslim group had construction several bridges in stultifying pace. This team had done yeomen service in several rescue missions in Kerala. Idols and curios, manufactured in several parts of the state, are a fusion of dexterity and technical know-how. Aranmula mirror, a unique mirrorKerala Architecture, Kerala Tourism being manufactured at Aranmula in Pathanamthitta, has taken the fame of Kerala's architecture overseas. Temples, churches and mosques abound in Kerala, signifying a glorious history and representing the eventful political, cultural and religious life of the state. History is a pervasive presence here. Many Christian churches were built with the help of Hindu Kings. However, the post-independent development spree, bereft of little concern for culture and tradition, has left our traditional knowledge system bear the brunt. Even amid the onslaught of modernism, a few embers glow that can fan up the Kerala consciousness. Padamanabhapuram Palace complex is located in a small village Padmanabhapuram, around 65 kilometers from Thiruvananthapuram. The palace complex is inside an old granite fortress around four kilometers long. The palace is located at the foot of the Veli Hills, which form a part of the Western Ghats. The river Valli flows nearby. The palace was constructed around 1601 A.D by Iravi Iravi Varma Kulasekhara Perumal who ruled Travancore between 1592 A.D. and 1609 A.D. In the late 18th century, the capital of Travancore was shifted from here to Trivandrum, and the place lost its former glory. 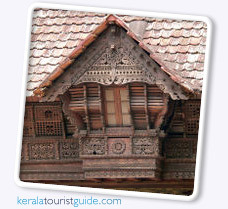 However, the palace complex continue to be the best examples of traditional Kerala architecture, and some portions of the sprawling complex are also the hall mark of traditional Kerala style building art.